A delegation led by the First Deputy Head of Ismayilli Executive Power Rovshan Agayev is on a visit to Uzbekistan. Azerbaijani delegation is headed by Azerbaijani Ambassador to Uzbekistan Huseyn Guliyev, Azertag reported. It includes First Deputy Head of Ismayilli Region Executive Power Rovshan Agayev, Director of Azerbaijani Culture Center named after Heydar Aliyev Samir Abbasov, head of Ismayilli Regional Culture Department Elnur Huseynov, chief editor of Ismayilli News Shahmammad Daglaroglu and businessman Azad Aliyev. 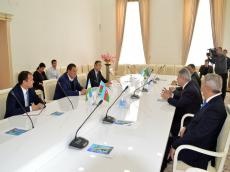 The delegation was first received by the head of the Fergana region of Uzbekistan, Shukhrat Ganiyev. Addressing the event, Shukhrat Ganiyev stressed the development of cooperation between our countries. He said that during the visit, a contract will be signed between the Ismayilli region and the city of Rishton, which will create a basis for deepening cooperation between our regions. In his speech, Huseyn Guliyev said that relations between Azerbaijan and Uzbekistan are at a high level. "The development of interregional relations plays an important role in further deepening of cooperation between our countries. That's why we are in Fergana today," he said. Ismayilli region is home to the sites of special natural interest and highly picturesque valleys. Located north of the country, Ismayilli was once part of Caucasian Albania – the 4th century B.C. Here, on top of the highest mountain lay the ruins of a medieval fortress. Maiden Tower is the most famous and significant historical monument of the area. The tower is located on the top of a steep mountain in the territory of the State Ismailli Reserve. There was an underground tunnel in the tower which led to the Javanshir Fortress. Many different nations and ethnic groups live in Ismayilli. Among them are Lezgins, Russians (malakans), Jews, lahy?ch and hapyts, the descendants of ancient Albans. One of the biggest Molokans villages in Azerbaijan called Ivanovka, founded in 1847 was established by the "Molokan" Russians who sought refuge in Azerbaijan after being ousted from Czarist Russia in the mid-19th century due to protesting Orthodox traditions. They have since lived in peace side by side with Azerbaijanis ever since. The village is famous for its fresh dairy products, tasty fruits and vegetables. The Basgal village of Ismayilli was widely known here as a center of handicrafts and sericulture in the middle ages. To this day, the traditional female headscarf - Kelagayi, which is included in the UNESCO's Representative List of the Intangible Heritage of Humanity has been manufactured in this village. Ismayilli has a very rich wildlife, hunting tourism has also prospered here. Forests in the area are inhabited by dears, mountain goats, wild boars, bears, wolves, foxes, hares and other animals. Rishton is one of the most famous and oldest centers of ceramics in Uzbekistan. Legend claims that the art is over 800 years old, passed down from generation to generation. The clay can be used without refinement or addition of other types of clay from other regions. The potters extracted various dyes, quartz sand, and fire clay from the surrounding the mountains. The history of producing ceramics here goes back to the seventh century. In the late 19th – early 20th centuries. Its clay is suitable for making the whole variety of ceramic goods and the repertoire of ornamental patterns in the Rishton ceramics is one of the richest. Today, over 2,000 craftsmen use both traditional techniques and modern machinery to produce over 5 million items per year.